This sticky toffee pudding has everything going for it: it is delicious, easy to make, requires no fancy equipment and everyone loves it. Preheat oven to 180°C and butter an 18 cm square cake tin. Mix dates and bicarbonate of soda. Pour over water and leave to stand. Cream butter and sugar, then add eggs, one at a time, beating well after each. Fold flour in gently, then stir in date mixture and vanilla and pour into prepared tin. Bake in centre of oven for 30–40 minutes until cooked when tested with a skewer. Cool for 5 minutes. To make the sauce, bring all ingredients to a boil. Reduce heat and simmer for 5 minutes. Remove vanilla bean. Invert cake onto a baking tray or onto an ovenproof serving plate. 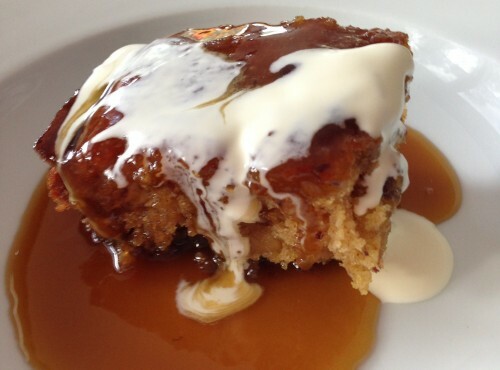 Pour a little sauce over warm pudding and return it to oven for 2–3 minutes so sauce soaks in. Cut pudding into squares and pass extra sauce. Chocolate Add 100 g chopped bittersweet chocolate before baking. Small puddings Pour batter into individual greased moulds or muffin tins and bake for 20 minutes. Pour over sauce and return to oven as for the large pudding.